May 22nd in Wordpress Plugins by Wordpress Jedi . In the past few years, we have covered many anti-malware, firewall, security, and file scanners for WordPress. Many of them have come and gone. But there are still many decent ones around. NinjaFirewall happens to be a useful script you can use to bolster your defenses. It is a web application firewall that blocks attacks on your site. NinjaFirewall can protect your site against RFI, LFI, XSS, code execution, SQL injections, and brute force attacks. It sanitizes GET/POST requests and scans your traffic. It can block uploads and sanitize uploaded file names. Just like many other plugins, this one hides errors and notices and can also block access to PHP scripts inside specific directories. 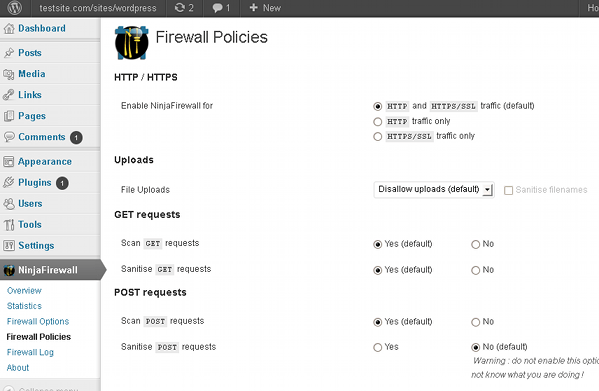 NinjaFirewall logs events, so you can get a better idea what’s happening on your site. It lets you block hack attempts and suspicious activities. The plugin is designed to handle distributed brute force attacks. It can alert you by email on specific events on your site. Overall, this is one of the best firewall plugins we have tested.